I've named this pair of earrings TAKARA which is a Japanese female name meaning 'treasure'. These stunning faceted briolettes here are mooakite. I was told by a very reliable source that there is a scarcity of good quality mooakite in the market and I should 'hoard' my stock. I'm sharing a pair here. These are the most fascinating set of stones I've handled recently. No two stones are alike, no two surfaces are alike! These are at the lighter end of the spectrum of colors this stone comes in. I love them. The brios measure approx 2cm, the body of the earposts measure approx 17mm x 15mm. Drop is 42mm. Earposts are sterling silver. 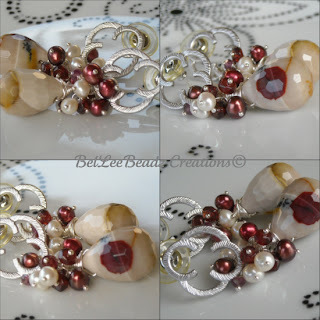 Embellished with cluster of garnets and freshwater pearls. Stunning in reality.